Burt Bacharach, Alfie Boe, Sophie Ellis-Bextor et al. DVD: 111 min., Blu-ray: 100 min. 'A Life in Song' is a celebration of the life and career of legendary songwriter Burt Bacharach. 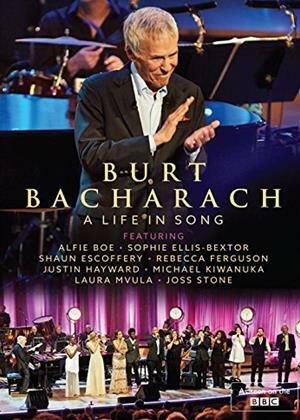 Filmed at London Royal Festival Hall, it features on stage conversations between Burt Bacharach and Michael Grade about many different aspects of his years in music. These discussions are interspersed with performances of many of his best loved songs by a line-up of great performers including: Alfie Boe, Sophie Ellis-Bextor, Shaun Escoffery, Rebecca Ferguson, Justin Hayward, Michael Kiwanuka, Laura Mvula and Joss Stone. The evening culminates in a medley of some of his most famous movie songs performed by Burt Bacharach and his band and a performance of That's What Friends Are For featuring the entire evenings cast.